I first met Brian Buckner when he came to my office to drop off his application for the Downtown Shreveport Pop UP Project. First impressions count and my initial take was that he was smart, dapper, and professional. After a morning of reading applications seemingly scrawled in crayon, experiencing his professionalism was refreshing and most welcome, but it wasn’t until he produced his large leather portfolio that I realized just how spot on my initial impression was. Brian is where he is now because of all the places he’s been. He has spent years being successful in the high end hospitality industry, the window manufacturing business, the car audio business. His success in those diverse fields has been powered by the intensity of his desire to be the best at whatever he happens to be doing at the moment. A lot of people want something but aren’t willing to put the time and work into getting it. Not so, Brian. He wants. He studies. He studies some more. He works. He succeeds. It is not a stretch, then, to believe that when he turned his attention to photography he would be successful on the business end, because he knows business. As a window tycoon he realized that the conversion of East Coast textile mills could mean millions for his business. As a car audio entrepreneur he realized that the world of discretionary spending for high dollar car stereo equipment was going to have to change in the wake of the bank and mortgage meltdown in 2008. He can be a dollars and cents guy, a Type A hard-charging guy, a do-not-quit guy, but an art guy? Brian’s first camera at age 22 was a Minolta SRT 202, a real camera, not just a point-and-shoot because even then he knew he didn’t want it to be easy. It also was not waterproof and an inadvertent dunk ruined it. A long spell ensued in which photography was not a priority… but all that changed four years ago when he purchased another professional camera. His work was good and pretty soon he started winning awards. The transition from interesting hobby to lucrative job is often difficult, but the thought of a career in which he had to depend on no one other than himself was attractive. So he did what he has always done; he dug in and studied, he made it a point to get better and he did. His eye was already good, he understood composition; he could ‘see’ what the photograph should look like and he didn’t mind the occasionally grueling and tedious work. Brian knows that attention to detail is what will set his work apart and he goes about it with a single-mindedness of purpose. Pear Cider Splash is created from 43 separate photos and took days to complete. Days. For one image (see page 2). 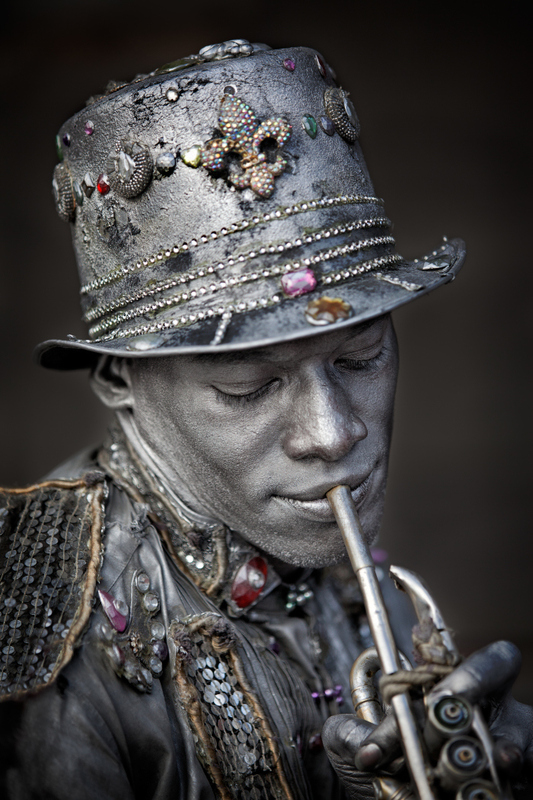 It was something he wanted to do to show his creativity in commercial photography, to stand out, to be discovered. Some people could take his comments as conceit, but Brian knows from years of business success that sharing one’s abilities is key. Why would someone use you if your work is no better than anyone else’s? Because they like you? Maybe. Brian is fine if you like him, but what he really wants is for you to know his work. It is quite clear that what he creates is art, but he knows that the word carries occasional negative connotation as in ‘starving’ or ‘whining’ or putting emotions or a self-serving cause du jour on display. Though possessing the eye of a fine artist, when pressed, he introduces himself as a commercial photographer who specializes in environmental portraiture. If you ask to see the one photograph that distills his work, he will show you 15 or 20, as one alone cannot tell his story. His photographs all have a quality that makes you feel as if they are somehow just out of reach but that you are in the scene. You are at the edge of the meadow at Shiprock, and with a hard hike, you will be at the base of the rock in a couple of hours. 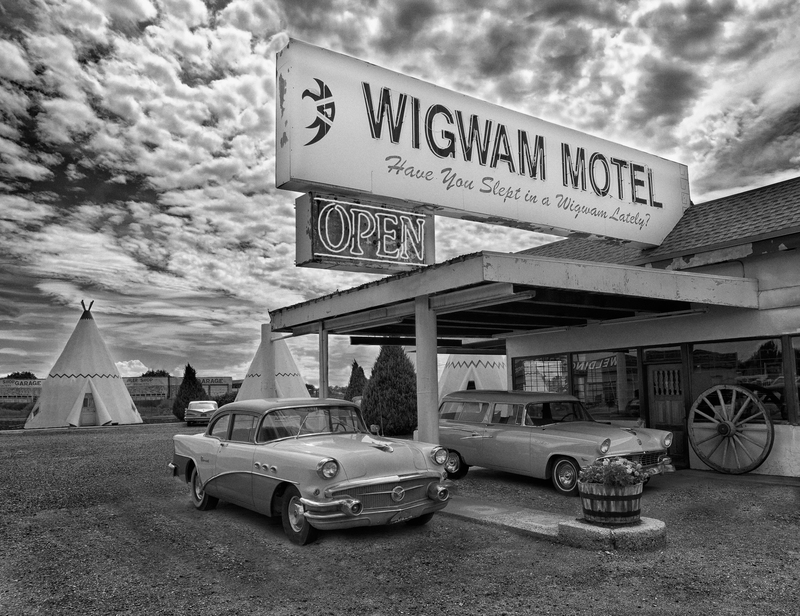 You can feel the gravel crunching underfoot in the parking lot of the Wigwam Motel. Are those rainclouds in the distance? Brian is convinced that commercial photography is where the money is and he looks forward to telling his clients’ stories through his amazing work. In the gaggle of photographers jostling for jobs, he is the calm one, the calculating one, the one who leaves nothing to chance and who never, ever quits. It is just a matter of time, really, until Brian, the re-inventor, succeeds again. See more of Brian’s work, and contact him at brianbucknerphotography.zenfolio.com/.